UD's Ioannis Poulakakis is investigating control strategies in four-legged running robots like this one as part of a new National Science Foundation grant. 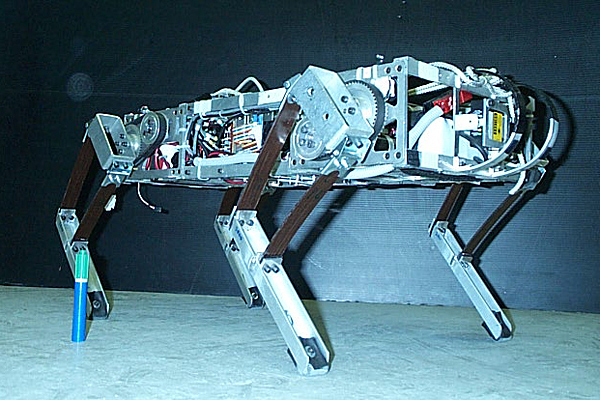 Pictured is Scout II, a robot on which he worked while a graduate student at McGill University. 8:39 a.m., Jan. 24, 2012--A cheetah running in its natural environment is an elegant, fluid display of biomechanics. What if robots could run the same way, and be deployed for search and rescue operations in areas where conventional vehicles cannot go? According to University of Delaware assistant professor Ioannis Poulakakis, a large fraction of the Earth’s surface remains inaccessible to conventional wheeled or tracked vehicles, while animals and humans traverse such terrain with ease and elegance. He believes that legs have the potential to extend the mobility of robots, enabling them to become useful in real-world situations, such as search and rescue. 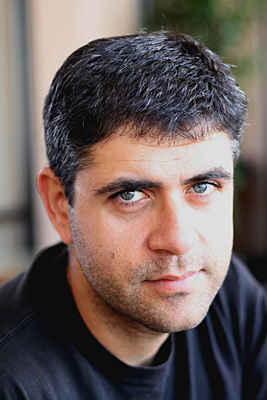 Poulakakis is the principal investigator of a three-year, $265,532 grant from the National Science Foundation (NSF) to develop a family of systematic control strategies that work together with the robot’s natural dynamics to generate fast, reliable and efficient running motions. The project, funded under NSF’s Division of Civil, Mechanical and Manufacturing Innovation (CMMI), will focus on the running motion of quadrupeds (four-legged robots) with elastic energy storage elements such as springs. If successful, the work would enable quadrupeds to move reliably at high speeds, self-correct to prevent falls and mimic their animal counterpart’s running motion.